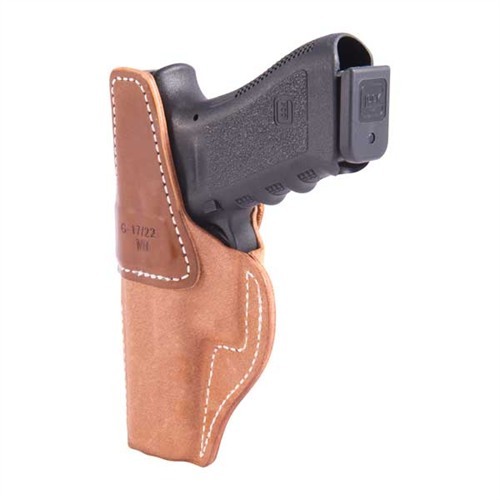 Glock 17/22 Classic inside the waistband holster offers optimum concealment and comfort. Open top style for a quick draw; wet molded to an exact fit for excellent retention. Steel reinforced top always remains open for easy, one hand reholstering. Rough-side-out texture grips clothing to prevent holster from shifting. Protective backflap prevents thumb safety from snagging on clothing; keeps slide from digging into your ribs. Sewn-in leather sight channel. Belt loops feature secure, one-way directional snaps. SIG P220-226 Holster does not fit guns with light rails. 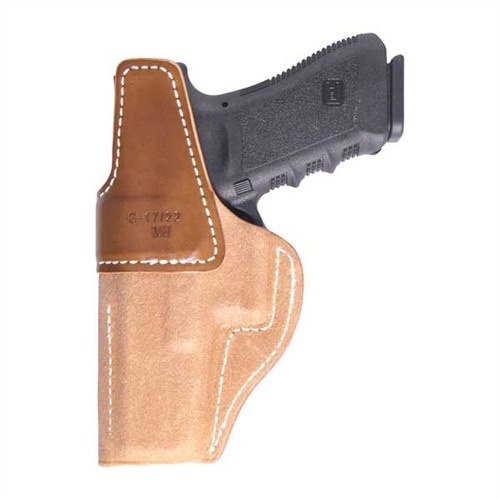 Glock 19/23 Classic inside the waistband holster offers optimum concealment and comfort. Open top style for a quick draw; wet molded to an exact fit for excellent retention. Steel reinforced top always remains open for easy, one hand reholstering. Rough-side-out texture grips clothing to prevent holster from shifting. Protective backflap prevents thumb safety from snagging on clothing; keeps slide from digging into your ribs. Sewn-in leather sight channel. Belt loops feature secure, one-way directional snaps. SIG P220-226 Holster does not fit guns with light rails. 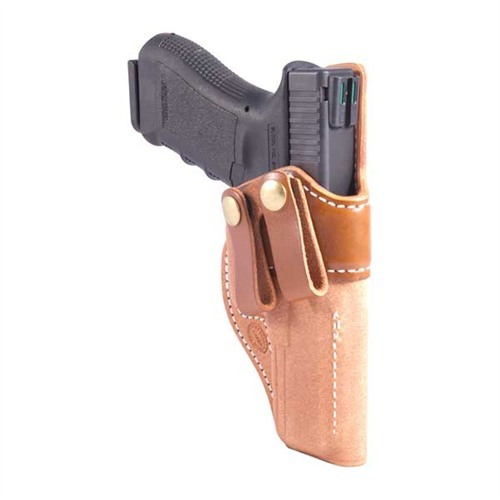 Glock 26/27 Classic inside the waistband holster offers optimum concealment and comfort. Open top style for a quick draw; wet molded to an exact fit for excellent retention. Steel reinforced top always remains open for easy, one hand reholstering. Rough-side-out texture grips clothing to prevent holster from shifting. Protective backflap prevents thumb safety from snagging on clothing; keeps slide from digging into your ribs. Sewn-in leather sight channel. Belt loops feature secure, one-way directional snaps. SIG P220-226 Holster does not fit guns with light rails. 1911 Government Model, 5" Barrel Length Classic inside the waistband holster offers optimum concealment and comfort. Open top style for a quick draw; wet molded to an exact fit for excellent retention. Steel reinforced top always remains open for easy, one hand reholstering. 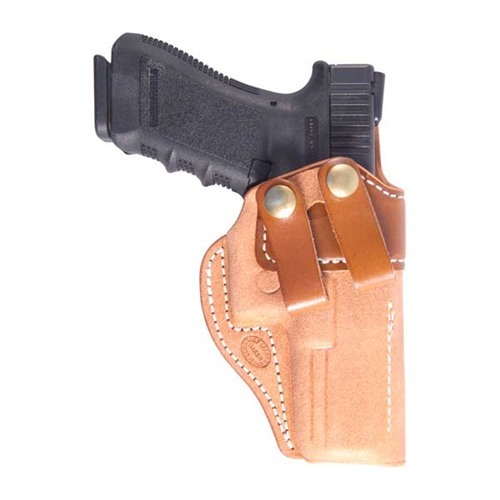 Rough-side-out texture grips clothing to prevent holster from shifting. Protective backflap prevents thumb safety from snagging on clothing; keeps slide from digging into your ribs. Sewn-in leather sight channel. Belt loops feature secure, one-way directional snaps. SIG P220-226 Holster does not fit guns with light rails. 1911 Commander Mode, 4.25" Barrel Length Classic inside the waistband holster offers optimum concealment and comfort. Open top style for a quick draw; wet molded to an exact fit for excellent retention. Steel reinforced top always remains open for easy, one hand reholstering. Rough-side-out texture grips clothing to prevent holster from shifting. Protective backflap prevents thumb safety from snagging on clothing; keeps slide from digging into your ribs. Sewn-in leather sight channel. Belt loops feature secure, one-way directional snaps. SIG P220-226 Holster does not fit guns with light rails. 1911 Officer's Model, 3.5" Barrel Length Classic inside the waistband holster offers optimum concealment and comfort. Open top style for a quick draw; wet molded to an exact fit for excellent retention. Steel reinforced top always remains open for easy, one hand reholstering. Rough-side-out texture grips clothing to prevent holster from shifting. Protective backflap prevents thumb safety from snagging on clothing; keeps slide from digging into your ribs. Sewn-in leather sight channel. Belt loops feature secure, one-way directional snaps. SIG P220-226 Holster does not fit guns with light rails.